The bounce of a ping-pong ball was all that stood between a very different look to the 2010 Stanley Cup Final. Back in 2007, the Chicago Blackhawks, 13th-place finishers in the Western Conference with a 31-42-9 record, got the lucky bounce and won the NHL Draft Lottery, finishing ahead of the Philadelphia Flyers, who were dead last in both the Eastern Conference and entire League with a 22-48-12 record. Thanks to that happenstance, the Blackhawks selected Patrick Kane with the top pick in the 2007 Entry Draft. The Flyers, picking second, took James van Riemsdyk. And now, three seasons later, the two clubs are competing for the Stanley Cup. That's quite a turnabout. "It shows if you finish last, there is hope," the Flyers' Simon Gagne said of the fast trip back up the ladder. "They finished last a couple times and got Kane and (Jonathan) Toews. We finished last before them and got (Mike) Richards and (Jeff) Carter." Actually, the Flyers were a pretty good team in 2003 when Richards (24th) and Carter (11th) were selected by the Flyers, but Gagne's point is well made. Building smartly through the draft can fast-track a team comeback. "It gives other teams hope that even if they finish last that they can come back and get into the Final. A team can turn around very quick," Gagne said. Back to 2007: Kane turned pro immediately and blossomed alongside Toews as the poster boys for the Blackhawks' inspiring resurgence. Kane has scored 76 goals and 154 assists in 244 regular-season games, and has playoff totals of 16 goals and 18 assists in 34 postseason games. Van Riemsdyk took the college route at New Hampshire and completed his rookie season with 15 goals and 20 assists in the regular season and an additional 2 goals and 2 assists in 18 playoff games. 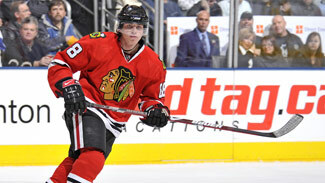 "It seems like it's almost worked out good for both teams," Kane told reporters. "They're here three years later. I'm here three years later, our team is, and that's the most important thing for this franchise." "We were both put in different situations and we were in different stages of our hockey development, and I did what I thought was best for me to be a better player," van Riemsdyk said. Happy homecoming -- After scoring the winning goal in Game 2, Chicago's Ben Eager, is -- pardon the pun -- eager, for Games 3 and 4 of the Final in Philadelphia, where he spent portions of three seasons. "I have a lot of great memories there," Eager said. "The Flyers gave me a chance to play in the NHL, which I'm grateful for. They were great to me when I was there and winning the Calder Cup there (in 2005 with the Philadelphia Phantoms) is something I'll never forget. I have a lot of great memories, but the Calder Cup year really sticks out." Flyers' job is clear -- It's said that it's never a series until someone loses a home game, so the Flyers know exactly what they have to do Wednesday and Friday at the Wachovia Center. "They won their home games," goalie Michael Leighton said. "And that's what we have to do. We have to go back home and win our home games, and we'll come back here and go again. But we've been playing good at home. Hopefully that will give us a little boost. "It's definitely going to be a difference, you know," Leighton said of being at the Wachovia Center. "We've obviously done well at home. We're looking forward to being back home. "We're still confident," Leighton continued. "Like I said, we played the third period (in Game 2) like we should. We dominated the third period, and we just couldn't get a bounce and get a goal. So we put 60 minutes together, we can beat any team. We're going back home and looking forward to it." Blackhawks coach Joel Quenneville also knows his team is going to face a new set of challenges come Wednesday night. "You've got to expect a loud building," Quenneville said. "I think we went into some loud buildings in Vancouver and San Jose in the playoffs. You eventually like to quiet it as best you can. But I think that's a challenge that's going to be out there. But I still think that being excited about thinking we have to be our best next game, it's going to be you a tough game and be ready for it." Trends to watch -- Here are a couple trends to watch for in Game 3 Wednesday night (8 p.m. ET, VERSUS, CBC, RDS). * The Flyers need to get on the board first. When the Blackhawks score first, they are 8-1 and a Chicago first goal will take the crowd out of it. The Flyers are just 5-5 when they allow the first goal. * Trailing after two periods is a death sentence for the Flyers, who are 0-4 when behind after 40 minutes. When Philadelphia has the lead after two periods, the Flyers are 10-0.